"HFPA" redirects here. For the audio recording format, see High Fidelity Pure Audio. 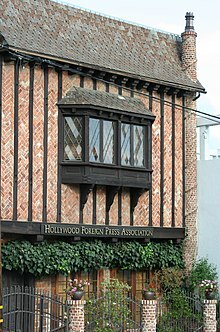 The Hollywood Foreign Press Association (HFPA) is a non-profit organization of journalists and photographers who report on the entertainment industry activity and interests in the United States for media (newspaper, magazine and book publication, television and radio broadcasting) predominantly outside the U.S. The HFPA consists of about 90 members from approximately 55 countries with a combined following of more than 250 million. It conducts the annual Golden Globe Awards ceremony in Los Angeles every January that honors notable examples of film and television and achievements in entertainment businesses. Hollywood Foreign Press Association building facade in West Hollywood, Ca. The association was founded in 1943, by Los Angeles-based foreign journalists who wanted a more organized distributing process of cinema news to non-U.S. markets. The first Golden Globes awardees were for the cinema industry in early 1944 with a ceremony at 20th Century Fox. There, Jennifer Jones was awarded Best Actress honors for The Song of Bernadette which also won for Best Film, while Paul Lukas took home Best Actor laurels for Watch on the Rhine. Awards were presented in the form of scrolls. The following year members came up with the idea of presenting winners with a golden globe encircled with a strip of motion picture film, and mounted on a pedestal. In 1950, differing philosophies among members caused a schism within the organization, resulting in a split into two separate groups: The Hollywood Foreign Correspondents Association and the Foreign Press Association of Hollywood. The separation ended in 1955 when the journalists reunited under the collective title The Hollywood Foreign Press Association with firm guidelines and requirements for membership. In 1955, the Golden Globes began honoring achievements in television as well as in film. The first honorees in the Best Television Show category that year were Dinah Shore, Lucy & Desi, The American Comedy and Davy Crockett. Membership meetings are held monthly, and the officers and directors are elected annually. A maximum of five journalists may be admitted to the organization each year. To retain "Active" status, each member must be currently accredited by the Motion Picture Association of America and must submit clippings of their work every year to renew their Active status or be reassigned to a non-voting, "Affiliate" status. Requirements for Active membership include primary residence in Southern California, attendance in at least four monthly general membership meetings, and a minimum of four published articles or photographs per year outside of the US. The HFPA does not release a list of acceptable publications for those articles, but they are not restricted to popular, mainstream ones. The HFPA is a non-profit organization that donates funds to entertainment-related charities. The Golden Globe Awards brings in about $10 million from its television broadcast each year. The HFPA hosts an annual Grants Banquet to distribute funds; $2.1 million was donated to non-profits in 2015. According to the HFPA, since 1990 more than $23.9 million has been donated to charity and used to fund scholarships and grants. Funds have also been used to restore more than 90 films, including King Kong (1933) and Woman on the Run (1950). ^ "Hollywood Foreign Press Association Elects Lorenzo Soria President". The Hollywood Reporter. Retrieved 20 January 2016. ^ a b "What is the Hollywood Foreign Press Association?". Vox. Retrieved 23 January 2016. ^ "Hollywood Foreign Press Association". Variety. Retrieved 20 January 2016. ^ Official website of the HFPA and the Golden Globe Awards. ^ "About HFPA- Golden Globes". Golden Globe Award. Retrieved 20 January 2016. ^ a b Hess, Stephen (1 January 2005). "Through Their Eyes: Foreign Correspondents in the United States". Brookings Institution Press. Retrieved 31 October 2016 – via Google Books. ^ "FindArticles.com - CBSi". Retrieved 31 October 2016. ^ Maureen Dragone. Who Makes the Golden Globes Go Around? North Hollywood, CA: Highstream, 2005. ^ Official website The Hollywood Foreign Press Association covering the entertainment capital for 68 years. ^ Howell, Peter (January 16, 2010). "The powerful nobodies behind the Golden Globes". Toronto Star. ^ a b Kilday, Gregg (13 August 2015). "Hollywood Foreign Press Hands Out More Than $2M in Grants". The Hollywood Reporter. Retrieved 5 July 2016. ^ "About the HFPA". www.goldenglobes.com. Retrieved 5 July 2016.